T&D distribute Deeter Liquid Level Sensors suitable for a variety of sensing applications including high temperature, high pressure and hazardous area float switches (ATEX & IECEx Certified). Deeter level sensors and float switches are available in a range of materials including stainless steel, PVC, PPS, nylon, polypropylene and acetal – vertical and horizontal mounting options. Customised level sensors and switches are available outside the standard ranges – call us with your requirement. Miniature moulded vertical liquid level sensor and float switch extensively specified in the food/beverage, automotive, medical and consumer industries. Change sensor from N/O to N/C by inverting float. Float specific gravity : PVC (0.7), Polypropylene (0.5), Acetal (0.6) and Nylon (0.6). 1 metre cable provided as standard – customised level sensors produced on request. Moulded horizontal liquid level sensor and float switch suitable for harsh (not hazardous) environments with excellent chemical resistance and temperature range performance -20°C to 80°C. High power switch and 400KPa maximum pressure. Horizontal mounted miniature liquid level sensors and float switches specified for internal or external tank mounting with excellent resistance to chemicals and wide operating temperature range. By rotating the level sensor body through 180° it is possible to sense for high or low conditions – 200 KPa maximum pressure. 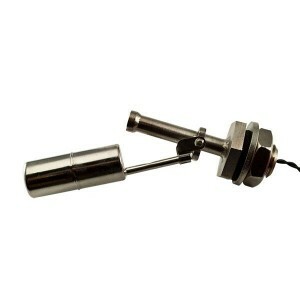 Vertical mounted miniature design liquid level sensor for internal tank mounting. Sensor available in UL/WRC listed PVC, Polypropylene, PPS and Nylon materials to permit use in most chemical and temperature environments – 200 KPa maximum pressure. Versatile and cost-effective solution. 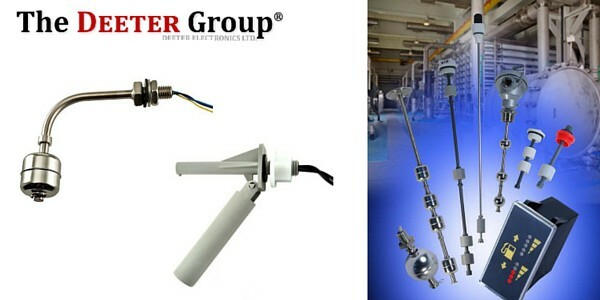 Compact vertically mounted liquid level sensor specified for high pressure and high temperature applications. Suitable for sensing chemically aggressive liquids. Sensor height is adjustable for varying switching depths. Available in 2 versions dependent on temperature requirements : standard version rated to 120°C or high temperature version sensor rated to 200°C. Small side mounted vertical liquid level sensor for high pressure and high temperature applications in the presence of chemically aggressive liquids – maximum pressure 10 bar. 316L stainless steel wetted materials – standard sensor version rated to 120°C or high temperature option rated to 200°C. Small horizontal mounted liquid level sensor manufactured from stainless steel designed for high pressure and high temperature installation and sensing chemically aggressive liquids – maximum pressure 350psi (24bar). 0.9 minimum liquid specific gravity. -20°C to +200°C high temperature version level sensor. Level sensor can be changed from Normally Open (NO) to Normally Closed (NC) operation to allow for sensing of high or low conditions by rotating the orientation of the sensor body through 180°. Switch contact ratings for level sensors are for pure resistive load – contact T&D for capacitive, inductive or incandescent lamps. 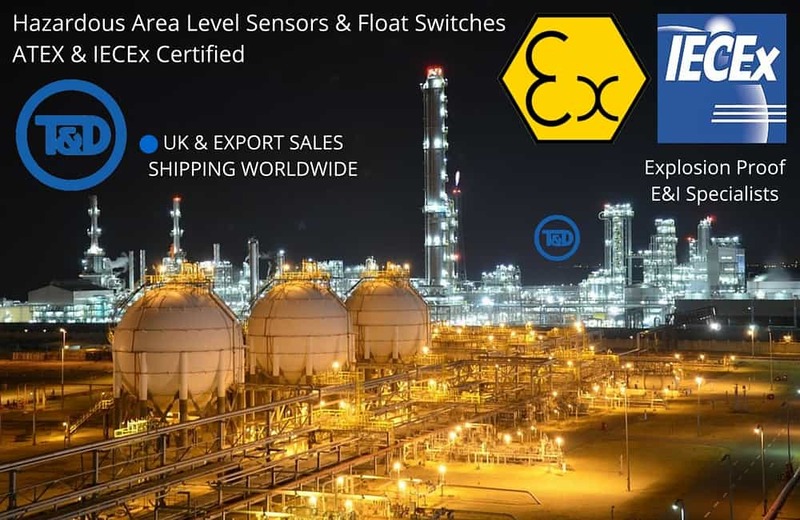 Deeter hazardous area liquid level sensors and float switches are ATEX and IECEx certified with Ex d Explosion Proof approvals for use in Zone 1 and Zone 2 hazardous areas without the need for an intrinsic safety barrier. Also, level sensors are available for hazardous areas which are suitable for use in Intrinsically Safe Systems with the use of a safety barrier. Level Sensors & Float Switches : ATEX IECEx & CSA Certified flameproof and explosion proof equipment is available for hazardous area applications. Image : ENPPI. Video about Deeter Electronics Ltd, a British manufacturer of Liquid Level Sensors and Float Switches. Contact T&D for Liquid Level Sensors & Float Switches at competitive prices from stock.